Looking for deals in Sofia? The newly opened modern 4-star Best Western Premier Sofia Airport Hotel is located in a new business district, only 2461 feet away by car from Sofia International Airport Terminal 1, 0.6 mi away by... I don't give 10's often but these generous folks upgraded my family to a larger suite in order to have us be more comfortable. I didn't ask for it - they simply exceeded my expectations. The room was incredible. Restaurant was wonderful and so were the additional facilities. Its a bit out of the city (we wanted to be close to airport) which has pro's and cons but to be honest I would stay here again in a heartbeat. Located in the heart of Sofia, Magic Castle Hotel offers modernly furnished rooms with free WiFi. Great location - to city center, to metro station, restaurants, etc. The staff is very nice, the price is very good. Metropolitan Hotel Sofia provides free WiFi, free airport pick-up and drop-off upon request and availability and free private parking on site. Big rooms, very clean, friendly staff. Minibar was free! 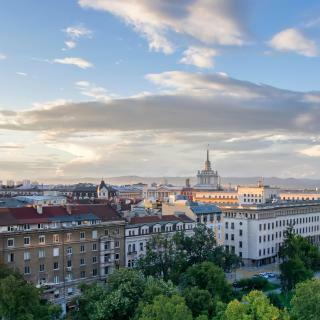 Set a 5-minute walk from the Serdika underground railway station, the 5-star Grand Hotel Sofia is located right in the heart of Sofia, overlooking the City Garden. An excellent hotel right in the centre of the city. The first impressions were made by the extremely helpful and courteous staff, in particular the concierge. The room was huge with a nice view of the city. 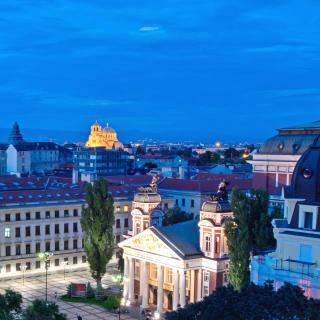 Hotel Arena di Serdica in Sofia from the FPI Hotels & Resorts chain is located in the heart of the city and is an excellent choice for business and cultural trips. Spacious room, hotel is built over te ruins if ancient city, which you can visit. This hotel with free Wi-Fi is just over half a mile from the Sofia EXPO exhibition center, 4 miles from Sofia's city center. The ATM Center Hotel features a gym, sauna and outdoor swimming pool. Good location, clean and tidy. Restaurant is available in the hotel. Located in a residential part of central Sofia, St. George offers modern accommodations 0.6 mi from the focal National Assembly Square. Most rooms are self-contained and all features free Wi-Fi... Nice hotel in the heart of Sofia. Polite stuff. Located in the Sofia's wealthy Boyana neighborhood at the foot of the Vitosha Mountain, the Hotel Villa Boyana offers free private parking and free Wi-Fi. I loved this place. The owner waited to welcome me when I had a late flight. Hotel Complex Jasmin is situated in the foot of the Vitosha Mountain in one of most prestigious suburbs of Sofia. Location, plentiful breakfast, good spacious rooms and the stuff is nice. Suite Hotel Sofia is located in the Students’ district of Sofia and features contemporary design accommodations with a panoramic restaurant, free WiFi, free access to a 24-hour gym and a web corner. Even though it’s not downtown, it’s in the ‘student town’ with lots of restaurants around. Opened in February 2013 and located close to the intersection with Bulgaria boulevard, Earth & People Hotel & SPA provides air-conditioned rooms with free WiFi, an indoor pool and a fitness. Great Hotel. Staff very happy to help !! Centrally located, Sofia Place Hotel is a 7-minute walk from St Sofia Cathedral and close to the pedestrian part of Vitosha Boulevard. It offers free internet access and a 24-hour reception desk. Great location on a lovely tree lined street one block from the Pedestrian Boulevard but very quiet. Hotel Anel is located in the center of Sofia, offering spacious rooms and free Wi-Fi internet access. Free private parking is available. The staff, the room, the location, everything was perfect. Located in the ideal city center of Sofia and a 5-minute walk away from Serdika Metro Station and the Parliament, COOP Hotel Sofia offers a 24-hour shuttle service upon request and at a surcharge. Profesionality of the staff, vast and modern rooms. 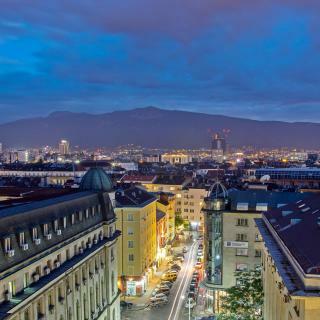 Hotel Les Fleurs is located on Vitosha Boulevard, the main shopping street in Sofia’s center, and just 1640 feet away from the central department store. Large comfortable room. Great location on a pedestrian street. Good breakfast. Which hotels in Sofia are good for families? Many families visiting Sofia loved staying at Central West Hotel, Magic Castle Hotel, and Hotel Complex Romantic. What are the best hotels in Sofia near Sofia Airport? Travelers who stayed in Sofia near Sofia Airport (SOF) have said good things about Ibis Sofia Airport Hotel - Park & Fly, Best Western Premier Sofia Airport Hotel, and Hotel Consul. Which hotels in Sofia are good for couples? These hotels in Sofia are highly rated by couples: Hotel Complex Romantic, Design Hotel 36, and InterContinental Sofia. Which hotels in Sofia offer an especially good breakfast? For hotels in Sofia that serve highly-rated breakfasts, try Hotel Complex Romantic, InterContinental Sofia, and Art 'Otel. How much does it cost to stay in a hotel in Sofia? On average, 3-star hotels in Sofia cost $51 per night, and 4-star hotels in Sofia are $71 per night. If you're looking for something really special, a 5-star hotel in Sofia can be found for $118 per night, on average (based on Booking.com prices). What are the best hotels in Sofia near Sofia Royal Palace? Some of the best hotels in Sofia near Sofia Royal Palace include The North Tower Apartment, Apartment Secession Style and 55 sqm new top center, quiet and cozy. How much is a hotel in Sofia for this weekend? The average price per night for a 3-star hotel in Sofia this weekend is $111 or, for a 4-star hotel, $151. Looking for something even fancier? 5-star hotels in Sofia for this weekend cost around $229 per night, on average (based on Booking.com prices). How much is a hotel in Sofia for tonight? On average, it costs $54 per night to book a 3-star hotel in Sofia for tonight. You'll pay around $86 if you choose to stay in a 4-star hotel tonight, while a 5-star hotel in Sofia will cost around $142, on average (based on Booking.com prices). Which neighborhood is the best one to stay at in Sofia? Centrum, Lozenets, and Oborishte are popular with other travelers visiting Sofia. Which hotels are the best ones to stay at in Sofia? Magic Castle Hotel, Grand Hotel Sofia, and Art 'Otel are some of the popular hotels in Sofia. Which hotels in Sofia have nice views? Jasmin Hotel, Grand Hotel Sofia, and Hotel Villa Boyana got great room view-related reviews from travelers in Sofia. Sofia is the Bulgarian capital and its largest city, situated at the foot of Vitosha Mountain in the very center of the Balkan Peninsula. With a variety of architectural styles, picturesque scenery and easy access to outdoor activities, this city is a definite must-see! From well-preserved city walls built in the 7th century BC through to the early Medieval buildings. From the 4th-century Rotunda St. George and 10th-century Boyana Church with its stunning 13th-century frescoes to Socialist-era monumental constructions, Sofia is a real treat for history lovers. Most of the popular landmarks are located in the Oborishte district, the most central part of the city featuring plenty of greenery, cobbled streets and the most popular landmark, the Neo-Byzantine Alexander Nevsky Cathedral. 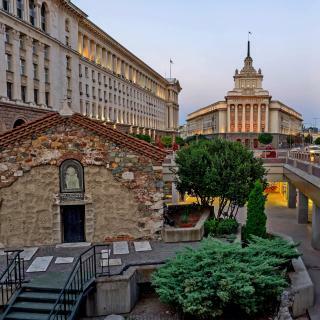 Sofia has plenty of natural sites too, including the renowned thermal and mineral springs, the primary reason Thracians established the city here before the 7th century BC. Enjoy a walk in the most popular parks, the Borisova gradina or the impressive Vitosha Nature Park with more than 6,500 acres within the city limits. From hiking to skiing on the Vitosha and from sightseeing to relaxing in mineral springs, Sofia has plenty of fun for everyone! On Booking.com you can find nearly 190 properties in the city, from 5-star central accommodations to convenient hotels near Sofia Airport. You should definitely take one of the free tours. You should definitely take one of the free tours. It starts in front of palace of justice and takes two hours. In April-October: 10 AM, 11 AM, 2PM & 6 PM and in November-March: 11 AM, 2PM & 6 PM. You will have good overview about the city - later you can go inside the major attractions. You should also consider taking trolley no 2 and see Boyana church and National Museum of History - take combined ticket for 12 BGN (you will save 8). As for food try Divaka Restaurant - you may eat quite cheaply when taking from daily menu. This will be really local food. Don't overlook the cultural excitement here--the Swimming Pool Gallery, the National Opera and Ballet, the Sfumato Theatre Workshop, just for starters. And I need to enthuse about Furna, with its excellent banitsas, charming staff, and relaxed atmosphere. I can't imagine a better way to start a day. . . . It is a very pretty and relatively small city ideal for walking. Sofia is not only good for sightseeing but also for walking in the parks and maybe going to an excursion up to Vitosha mountain. Good and cheap food - amazing nightlife - nice and big shopping malls. It's a smart, relaxed city with a lot to see and do. It's a smart, relaxed city with a lot to see and do. I went to the ballet one evening, visited art galleries one afternoon (check out the Swimming Pool Gallery! ), took a trip by public transit to a monastery outside the city another. I came away impressed both by Sofia's sophistication and friendliness. Sofia is a very beautiful city nestled in between the mountains of Vitosha. The highlight of my trip was definitely the 365 tour. It is a free 2 hour tour and starts promptly at 2pm every day of the year. Our tour guide Stanislav was excellent, he knew the history, the landmarks, the city inside out and was incredibly funny. Loved the tour!! The only big city in Bulgaria. The only big city in Bulgaria. Lots of + and - But basically, here you can find the variety of people + all the stuff that a big city offers such as amazing, good restaurants, bars, clubs, all kids of shops, activities, etc.. On the negative note, it's the only city in Bulgaria, which gets heavily invested in, while the rest of the country is in demographic crisis. Still, some neighborhoods should not be visited alone at night, so stick to the center and find some local guide! Annually there are good musical festivals here, and the "business" of Bulgaria is heavily concentrated at that city. Just ignore the politics... One of the most historical countries with one of the wost political and government traitors... Sad combo. clean and comfortable apartment in the center of Sofia, with private street parking for free. right across the street is a no commission exchange money office (very helpful?) 24h heat and hot water! 1km top distance from all the known sightseeing of the Bulgarian capital! the most helpful host you can have is the owner of this house, really! with perfect knowledge of the English language and a lot of suggestions for good and cheap places! next time, I'll stay here again for sure! Excellent! I've stayed here four times over the past two years while visiting from the United States. Easy to get to from the airport and train/bus station via the metro (or taxi). A short walk from the European Union station/stop. The clean, quiet, modern room was a delight to return to after a day of walking around sightseeing or hiking on Vitosha. FYI My Bulgarian friends and I found out that the large park nearby is perfect for flying model airplanes! -the location is great, very close to the center metro station and other intersting places for tourists. - the hostel provides soap, shamoo, toothpaste and a towel. - there is no air conditioner, but there is a fan and it does the job. - you'll find in the kitchen all the dishes you might need for cooking. - at the reception you'll get a nice map of sofia with explanations about Bulgaria and more cool and important stuff. Everything you can expect from a top class hotel is delivered. Professional staff, great rooms (we got an upgrade), good facilities, parking and a splendid location in the hart of the center. Our stay was beyond expectation and definitely the best hotel we had in our tour around all major cities in Bulgaria. Lovely hotel at a reasonable price. The staff were friendly and helpful, good buffet breakfast with freshly squeezed orange juice which is unusual for Bulgaria. Some hotel rooms have poor lighting but not so in this hotel the rooms have lights everywhere. Good WiFi. Perfect location for meetings in the center and added benefit; it is Literally opposite the main building for the EU Presidency of Bulgaria in 2018 (https://eu2018bg.bg/) It is also at walking distance of the old towns city center which is very lively. Great location within walking distance to Alexandar Nevski Cathedral. Nice neighbourhood close to shops and restaurants. Comfortable bed. Clean. Friendly staff. Decent buffet breakfast. Excellent wifi. Good restaurant on site with some tasty Bulgarian dishes. Spacious, clean, comfortable room in the heart of the city center but on a pedestrian side street. Staff was very friendly. WiFi works well. 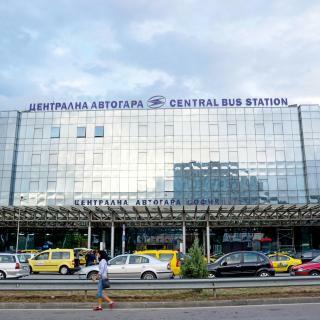 Easy connection to/from Sofia Airport via the nearby Serdica metro station. Overall a good value for Sofia. Near the metro and the airport. The most comfortable bed I’ve been in at a Bulgarian hotel, the best breakfast I’ve had in a hotel in Bulgaria, very clean and not smoky, very nice staff and great spa area. We enjoyed our stay very much. Apartment-hotel is very nice, location is great and people at reception very kind. Parking in next street is great. I enjoyed Sofia and Bulgaria a lot. The country and the people. Would definitely go back to this hotel in the city. Location is perfect, stuff is really kind and helpful. The hotel is not renovated but it helps to understand the socialistic history of Bulgaria. :) Who wants modern new looking hotels should avoid this one. The room is new, clean, big and nicely designed. The location is perfect! Close to everything. The bad is really comfortable, the best I had in all the hotels I went in Bulgaria. Will highly recommand! Good connections to downtown. Walking distance to one of Sofia's shopping mall. Last but not least, a fabulous traditional Bulgarian restaurant 50 meters away from the hotel. Everything was amazing. Clean room, good location, friendly staff. Even though the shower had no curtains but that was one of Bulgarian culture, which was good experience for me. Central location, friendly and helpful staff. The breakfast includes a selection of Bulgarian specialties, which is a very nice touch.